The Adventure Game : Bizarre celebrity quiz programme on BBC2. 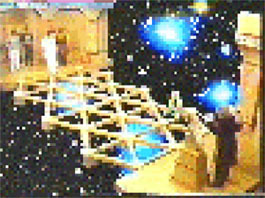 Four travellers would go around a maze of puzzles trying to win green cheese rolls before ending up at "The Vortex" a grid where you had to get from one end to the other without being captured by an invisible beam. The beam was controlled by "Grandpa" an Aspidistra.that shook while it "talked". Upset Granpa and you had to bow your head and say "Gronda Gronda your highness". Grandpa couldn't speak he'd sort of go, er, well. put you finger in your mouth, make a lot of noise and move your finger up and down (don't ask). Mostly remembered now for staring Moira Stewart before her move to BBC News (though she'd been on BBC Radio for a while), the show's idea has been seen since on The Crystal Maze, Jungle Run and is currently enjoyed as Mission 2110 (which is well worth a watch on CBBC if you get the chance). Alfanzo Bonzo: "Alfonzo" was an Italian exchange student. The main character was a young lad (Billy I think) who was always swopping stuff. Alfonzo turns up and gives 'Billy' something with amazing powers in each episode, which inevitably leads to hilarious goings-on. At the end of each episode, 'Billy', who narrated the story of what happened to him, would be asked "But what happened then?" or "But what about X? ", and he would reply "I was just COMING to that..." and we'd have to wait until next week. Alphabet Zoo: Ralf McTell's show before he moved to "Tickle on the Tum". Each week, a different animal starting with a different letter of the alphabet. Songs story and the sort of things that used to happen on lunchtime kids TV. Animal Kwackers: As confirmed by the opening titles, the Kwackers were Bongo, Rory, Twang and Boots. A group of animals that formed a band, as they do. Do you remember the story telling bit. "Rory, Rory, tell us a story. Rory, Rory, tell us what it is. Animal Magic: Johnny Morris' popular programme about animals which was taken away in it's prime by the BBC for no reason whatsoever. As well as telling you about the animals, Johnny would add voices and talk to them. Well remembered for the marvellous moment when an Orang-u-tang hands Johnny her new-born baby: "Go on then if you think you can do a better job.". Around the World with Willy Fog : "I know" said someone one day, "Let's take some classic tales and make them accessable for kids. For a kick off Jules Verne's Around the World In 80 Days shouldn't be too difficult!". So here's the result, a cartoon adventure of a lion (Fogg) attempting to go around the world with a lynx (Rigadon) and mouse (Teeko) in 80 days. Whilst on his travels Fogg manages to rescue a love interest, Romy, (a panther, not a tiger as I first thought) just before she is sacrificed by a tribe. Anyone remember National Willy Fog Day? April 28th 1988 (according to Wikipedia anyway). Now how old do you feel? Automan : From a time when transport had to do cool things (Knight Rider, Street Hawk, Airwolf). I personally don't remember it but quite a few people have e-mailed me to tell me about it without telling me much about it. See if the opening titles jog any memories.